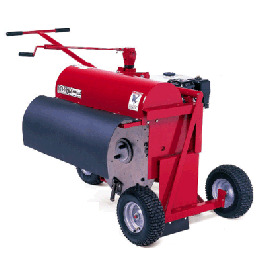 Cut neat, clean trenches up to 12" deep with the Little Beaver Kwik-Trench Earth Saw. The compact size of this powerful saw lets you get into areas that are inaccessible to full-size trenchers. -- Please Select --Super Xtra Rock Blade- 1"
For over 50 years, the Kwik-Trench Earth Saw has met the shallow trenching needs of rental stores, contractors, and golf course superintendents. Thanks to its simple push-forward design, the Kwik-Trench has proven itself as the fastest, easiest to use, and most economical mini-trencher on the market today. The Kwik-Trench’s compact size lets you get into areas that are inaccessible to full-size trenchers. A manual crank on belt-driven models infinitely controls your cutting depth (up to 12") while a locking swivel wheel lets you cut straight trenches. Heat-treated, hardened steel teeth are carbide tipped for superior performance and extra long life. 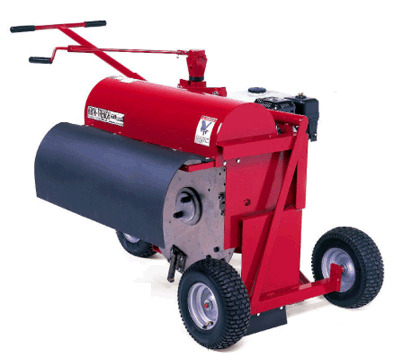 Driven by triple v-belts, the cutter wheel rotates up to 800 rpm for fast, clean cutting. A slip clutch is built into the hub of the cutter wheel, protecting the engine and drive train from wear or damage. Trench width sizes from 1"– 4" are obtained through various combinations of teeth styles and teeth mounting locations. Not only does the Kwik-Trench cut your trenching time, but it also cuts your backfill time. By making clean, narrow trenches and neatly depositing the spoil right next to the trench, both backfill and cleanup time are minimized. And while they’re not self-propelled, all Kwik-Trench Earth Saws feature pneumatic tires, so you won’t spend extra time repairing damaged turf caused by tracked machines or skid-steer loaders.